Pakistan Star winning last season’s Group One Champions & Chater Cup at Sha Tin. Photos: Kenneth Chan. 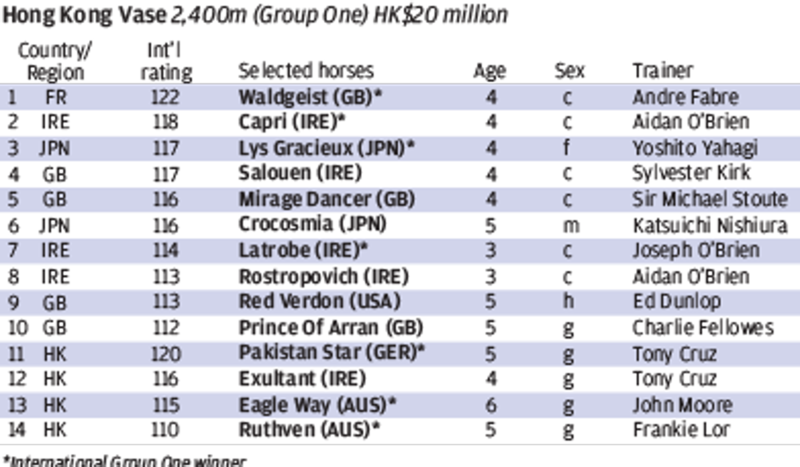 Pakistan Star will need to not only turn his own form around but defy history if he is to take out the Longines Hong Kong Vase (2,400m) next month with the quirky gelding needing to break a long run of outs for local horses in the race. Hong Kong horses have a woeful record, winning just twice in its 24-year history, with Europeans frequently taking out the HK$20 million event. Along with the 10 internationals Pakistan Star – who will be ridden by William Buick – has to fend off, he will also have to keep a trio of red-hot locals at bay. International Group One winners Waldgeist, Capri, Latrobe and Lys Gracieux headline the field along with recent Melbourne Cup placegetter Prince Of Arran, who is also making the trip to Hong Kong. Last Sunday’s dominant Group Two Jockey Club Cup (2,000m) winner Eagle Way will line up in the field despite setting a 2,000m Sha Tin record in the process, as will runner-up Exultant. After being initially aimed at the Melbourne Cup, Irish Derby winner Latrobe had just one start in Australia in the Group One Mackinnon Stakes (2,000m) after a minor setback. Having impressed there for a second placing, owner Lloyd Williams decided to forge ahead to Hong Kong. All eyes will be on fellow Irish galloper Capri this weekend with legendary trainer Aidan O’Brien opting for a Group One Japan Cup (2,000m) tilt before making his way to Hong Kong. Having won for connections throughout Europe, Dubai and Australia, Prince Of Arran will be hoping to add Hong Kong to the list with jockey Michael Walker booked to ride. Trainer Charlie Fellowes said he planned to fly his horse to Hong Kong early next week, where he will stay in quarantine before the race. “He’s been remarkable. If you told me in January that 10 months later I’d be flying over for the Hong Kong Vase and going there with a realistic shout I’d have chuckled,” he said of his chances in the race. Connections of Japanese horse Lys Gracieux have opted to pay the late entry fee to race in the Vase after originally just entering for the 2,000m Cup following her Group One Queen Elizabeth II Cup (2,200m) win just a week ago.